The best strategies use tools in combination, particularly because applying an AWM approach requires people to integrate their use of these management tools. Finding the best suite of tools for your area takes time and planning. Incorporating several management practices requires you to understand Qfly biology and ecology; however, there are general principles which apply. For urban and backyard treatments, managing Qfly will depend on what strategies the community will accept and the support given to the community. Some chemicals require licensed pest control operators to apply them. Mass trapping, hygiene, sterile insect technique (SIT) and monitoring are most likely to be part of an integrated AWM program and be more accepted (studies support this). Local gardening stores or councils can be useful to talk to about programs to manage Qfly. For Australian horticultural production, hygiene, bait sprays and the male annihilation technique are available tools for all regions and suitable for many crop types. For Australian backyard gardeners, a number of options are also available. 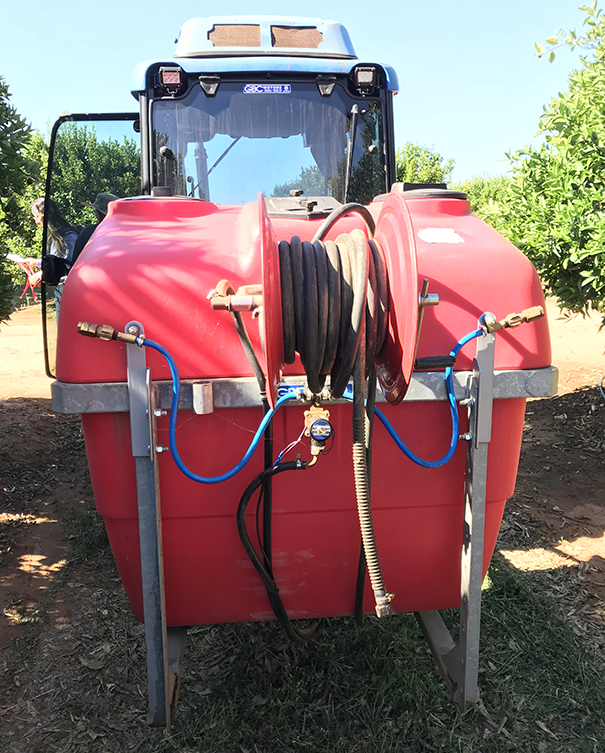 Hygiene means keeping your gardens, orchards, vineyards, and other non-crop areas clean, and discouraging the fly’s ability to live and reproduce in the landscape. This is critical to preventing fruit flies becoming established in your area. Hygiene works by you removing all possible places that the fly can complete its life cycle. This includes picking all fruit off trees, post-harvest, and picking up infested fruit that has dropped on the ground. It is important to then dispose of the fruit appropriately. Put infested fruit in a sealed bag in the sun for 3–4 days to destroy any eggs or larvae, and contact your local council or state department for further advice. Removing unwanted or neglected hosts is also crucial, as these are potential breeding sites for Qfly – then you will not have to worry about them. If you have trees in backyards, keep them to a manageable height so you can pick all the fruit. Do not forget to include fruiting windbreak trees. Hygiene also refers to on-farm biosecurity practices that prevent Qfly from entering a property from the start. What is a bait spray? Bait spraying to manage Qfly is a targeted tactic: it is done to very specific areas and lasts a short time. The spray consists of a protein source (e.g. yeast autolysate) and a toxic substance (e.g. an insecticide). It can be used strategically to match the emergence of flies. It can protect ripening fruit as it becomes more susceptible to Qfly. It is a targeted spray with minimal effect on non-target organisms (such as beneficial insects). Bait sprays attract and kill Qfly. When they are feeding on the protein, they come in contact with the insecticide. Both male and female Qfly need protein to sexually mature. Female flies are especially attracted to the protein when they are maturing and growing eggs. 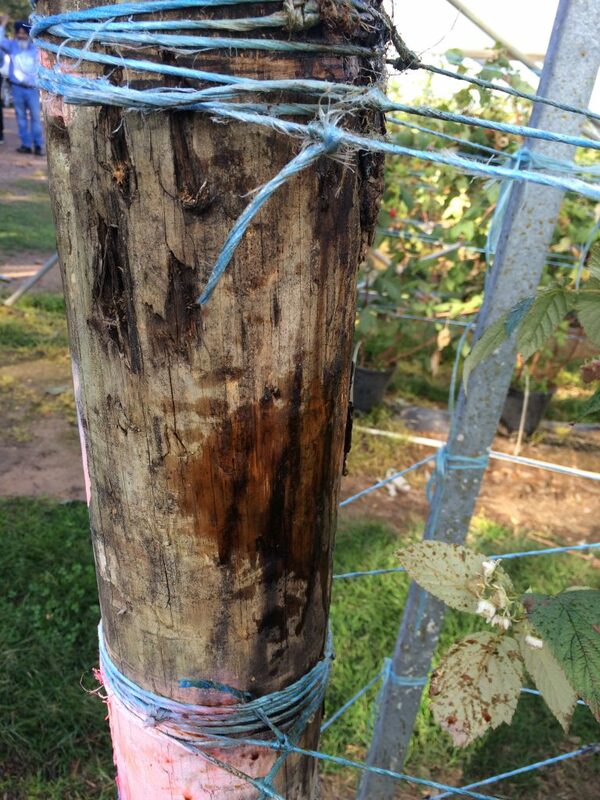 Generally you apply bait sprays to the trunk or foliage of trees, or on trellis posts (where the Qfly is likely to be active), using a jet stream nozzle, for example. You should avoid spraying fruit, to avoid concerns about residue and fruit damage. The effectiveness of bait sprays is generally short-lived, especially during periods of high temperatures or rainfall. You might need to repeat an application in this case. You can adjust how often you spray according to risk. Follow the recommendations on the label, and record any sprays you do. Current recommendations usually prescribe application for 6–8 weeks before harvest, but you will achieve the best results if you start applying bait spray early in the season and consistently (usually weekly). This timing matches the first emergence of Qfly. Ideally, bait spraying should be from Spring through Autumn. However, flies may be active even earlier: vineyards might be next to other crops that mature earlier, or other backyards may have early hosts. Look around, monitor and make sure you start before any flies move in. Apply early in the morning, when Qfly is likely to feed. Combine bait sprays, hygiene and male annihilation technique for the best results. Try not to miss an application – consistency is key. Cover the entire block (and surrounds) – Qfly can move around. Reapply after hot weather or rain. Do not apply on the ground. Increase the effect of the spray by adding gels or thickeners – they might improve longevity. What is male annihilation technique (MAT)? MAT is an ‘attract and kill’ strategy for male flies. The aim is to reduce male fly populations to low levels to reduce the mating opportunities for females. There are several different MAT types available with different shapes, sizes and insecticides. The technique involves you distributing cups called ‘MAT stations’that attract male flies with the male fly attractant ‘FT Cuelure’. The stations also contain an insecticide. The stations are similar to the traps used for monitoring, except that the flies are not trapped. The flies feed on the MAT and are killed. You will get the best results from this technqiue if you use MAT over large areas in combination with bait sprays. You can also put MAT stations within Lynfield traps, or other types, as a monitoring tool that attracts males. Note: The Culture in MAT stations impacts Lynfield traps used in export trapping networks. If you plan to export, please check with your relevant domestic/international regulatory body if there are any restrictions on the use of in-field MAT. MAT are usually placed throughout the block at a density of about 16–20 per hectare, throughout the crop and in alternate hosts (e.g. vegetable gardens, fruiting windbreaks). You should also space MAT every 20 metres around the perimeter of the property or block, early in the season (e.g. late winter/early spring), to reduce the number of male flies entering. You typically need to replace MAT stations every 3–4 months; the label will tell you the correct timing. In areas with winter trap catches, replace or add MAT up to 4 times a year (e.g. August, November, February and May). In areas without winter trap catches, then 3 times a year may suffice (e.g. August, November and February). Use over large areas for increasing effectiveness. Replace as recommended on the label. Use throughout periods of the year when Qfly is present. Use in combination with bait sprays and hygiene. A cover spray is applying a pesticide that covers the entire tree or host crop. Chemical cover sprays are usually considered an option when pest pressure is especially high. Chemicals are registered in Australia by the Australian Pesticides and Veterinary Medicines Authority (APVMA) and must be used according to the label. Please seek advice if you are unsure about using pesticides. Unintended consequences of cover sprays include, for example, reducing numbers of beneficial insects (natural predators that help control other pests). Different chemicals work in a number of different ways and, because of this, they each have very different required methods/numbers of applications. Please seek advice if you are unsure. Apply them as per their label’s instructions, and record what you do. Apply cover sprays only according to label instructions. Make sure your spray equipment is properly calibrated. If exporting, check the maximum residue limit levels of the importer. Urban areas within an AWM region can provide habitat for Qfly, and the choice of strategies for urban areas depends on the acceptance of those strategies by the community, and the level of support provided to the community when participating. 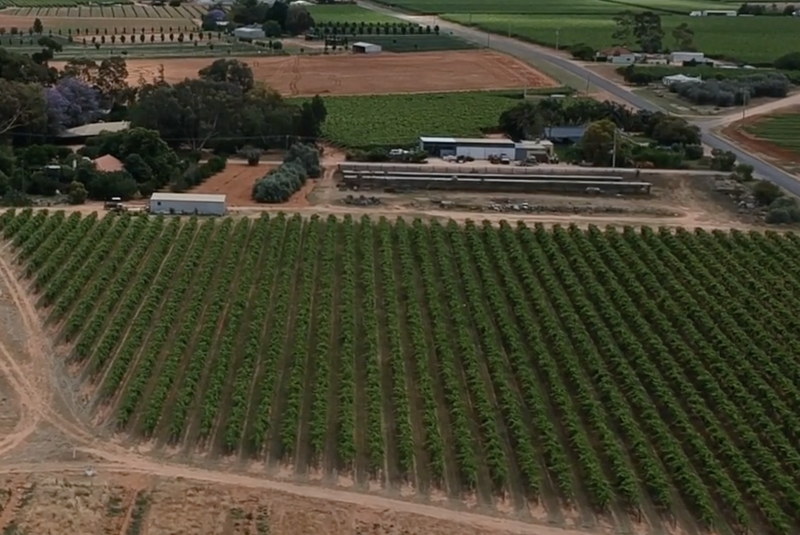 The individual methods or treatments used in AWM can be the same as those used on-farm but some may be prohibited by regulation for use in home gardens or public spaces or require application by licensed pest control operators. Treatments used on-farm such as hygiene, baiting, trapping (and monitoring) can be used off-farm as part of an integrated AWM program across regions. Trapping, host removal and SIT seem to be options that are acceptable (See the science that supports this). There are several excellent resources to get more details, but in summary the best controls for backyard gardens are based around good hygiene, the removal of unwanted or damage fruit, and netting or bagging of fruit and vegetable crops. Choosing management tools for urban spaces is difficult; options need to be acceptable to the community and practical to implement. Talk to your local gardening store, or see if your local council is involved in an urban management program. The sterile insect technique (SIT) involves releasing large numbers of sterile male fruit flies into areas with low native, or endemic, Qfly populations. SIT is not yet commercially available in Australia, but a new facility to breed large numbers of Qfly was built in Port Augusta, South Australia. The success of SIT relies upon large numbers of sterile flies released into the field, outnumbering the wild male population to limit the opportunity for wild females to mate with wild males and produce viable offspring. The outcome is that the population is progressively suppressed. SIT works best once the fly population is at a low level, making it a valuable tool within an AWM approach, not a standalone tactic. Researchers still have to test the best methods to release the new sterile flies in Australia at an Area Wide Management scale. The flies could be released from a vehicle, or from a plane. Once, you have implemented the steps and your area is SIT ready, you may wish to be involved in a SIT program. When the technique becomes available, it will include reliable methods for ensuring sterility, and for distinguishing sterile flies from wild flies. More information about how to get involved in future trials and programs will be available in the near future. Mass trapping usually refers to placing many traps within a defined area (high density). The goal is to trap large numbers of flies and reduce Qfly pressure. Note: ‘Mass trapping’ can also be used to describe single traps that catch a large number of flies. There are some traps commercially available, and some orchards are currently trialling the effectiveness of this approach. Generally these trials involve traps that aim to catch females (‘female-biased’) using a bait attractant, not FT Cuelure – this is why they require high-density placement. Traps are generally placed with high density. However, trap types vary and influence this density, and you should always research the label and check manufacturer recommendations. They can be used in backyard gardens, and also come in organic varieties. Mass trapping is considered an approach for control – not for monitoring.